The Greater Bangor area is home to Maine's only NCAA Division I athletics program, which features a national championship hockey program and a nationally ranked Division I-AA football program. The Queen City is also home to Little League Baseball's Senior League Baseball World Series, held every August at Mansfield Stadium. In the spring, summer, and fall, you can explore the outdoors by taking the many hiking and mountain biking trails in the area. In the winter, the trails enable outdoor enthusiasts to cross country ski or snowshoe. Youths can also participate in spring and fall soccer programs and baseball. The UMaine men's hockey team is a perennial power in the NCAA tournament. The team won national championships in 1993 and 1999. 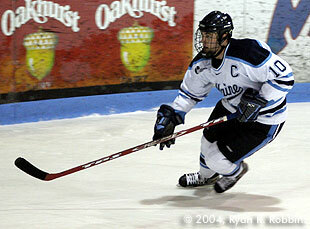 The University of Maine offers more than 20 NCAA Division I men's and women's teams. Under the leadership of the late Shawn Walsh, the men's hockey team rose to national prominence in the late 1980s. The Black Bears have reached the NCAA Frozen Four nine times and the national championship game six times, most recently in 2004. The Black Bears had a record of 42-1-2 when they won their first national championship in 1993. They won their second national title in 1999. Their overall NCAA tournament record is 26-16.
Notable hockey alumni include Paul Kariya, Eric Weinrich, Garth Snow, Scott Pellerin and Mike Dunham. Pellerin won the Hobey Baker Award, given to college hockey's best player, in 1992; Kariya won the award in 1993 as the first and only freshman to win the award. The men's hockey program shares Harold Alfond Sports Arena with the women's hockey program and the men's and women's basketball programs. The prime indoor sports arena at UMaine, Alfond has a hockey seating capacity of 5,200 and a basketball seating capacity of about 5,600. The arena opened in November 1977 with 3,300 seats. In the late-1980s, the university added a balcony with 500 bleacher seats. Then, in 1991, Harold Alfond, former owner of Dexter Shoe, donated more than $1 million for the university to expand the arena. The basketball programs moved into the arena in 1992 after playing for a few years at the Bangor Auditorium. The UMaine women's basketball team has made it to the NCAA tournament seven times. The women's basketball program reached the NCAA tournament for six consecutive years, beginning in 1995 through 2000. 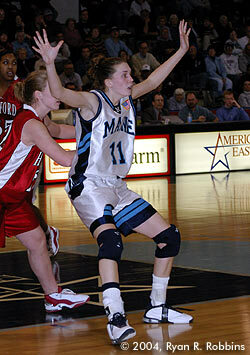 In 2000, UMaine advanced to the second round. Two former players -- Cindy Blodgett (Cleveland Rockers and Sacramento Monarchs) and Jamie Cassidy (Miami Sol) -- have played in the WNBA. The UMaine men's basketball program is on the verge of reaching the upper echelon of the America East conference. Head coach John Giannini, who won a Division III national championship at Rowan College in 1996, led the Black Bears to 18 wins or more for three consecutive seasons before a disappointing regular season in 2001-2002. 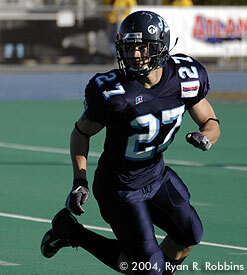 He led the Black Bears to the America East championship game in 2004. Giannini left UMaine for LaSalle several months later. The baseball program, once the premier program in New England and the Northeast, has played in the College World Series seven times (1964, 1976, 1981, 1982, 1983, 1984 and 1986). The team won the America East regular season and tournament titles in 2002 for its first conference title and NCAA tournament appearance since 1993. In 2005, the Black Bears won the America East tournament before going 1-2 in an NCAA regional in Mississippi. Mahaney Diamond has a seating capacity of about 4,000. Recent renovations have included a new sound system, new netting behind home plate and an enlarged press box that should make the stadium competitive in a bid for an NCAA regional. As one of the northernmost teams in the country, the Black Bears are at a severe disadvantage against teams from the South. The team spends most of its season practicing indoors at the UMaine field house. The UMaine Black Bears have made it to the NCAA Division I-AA playoffs twice in the last four seasons. Notable former UMaine players include catcher Carl "Stump" Merrill (New York Yankees farm system coach and manager), pitcher Bill Swift (Seattle Mariners, San Francisco Giants, Colorado Rockies) and shortstop Mike Bordick (Oakland Athletics, Baltimore Orioles, New York Mets). Often overlooked, the 2001 football team surprised sportswriters, coaches and fans alike when it not only won a share of the Atlantic 10 conference title in NCAA Division I-AA play but became the first Black Bears team to win an NCAA playoff game. In 2004, the team defeated Division I-A opponent Mississippi State at Mississippi. Led by longtime UMaine coach and alumnus Jack Cosgrove, the Black Bears play their home games at Harold Alfond Stadium. Built in 1998 to replace the condemned Alumni Stadium, Alfond Stadium seats more than 8,000 and features artificial turf, an all-weather track, lights and a full-size message board. Alfond Stadium is also home to the men's and women's outdoor track programs and the field hockey program. Harness racing has been a Bangor tradition since the mid-1800s. Since 1883, Bangor Raceway at Bass Park has been home to harness racing. Interest in the once immensely popular sport has waned in recent years, but this has not deterred the diehard owners, trainers and drivers from putting on a good show for every program. Bangor Raceway is one of only two "full-time" tracks in the state, Scarborough Downs being the other. Bangor's season begins in May and runs through July. Admission and parking are free, making harness racing the best entertainment value in the area. The raceway features a 1/2-mile track and a 3,000-seat grandstand. Off-track betting is available. Sunday afternoons at the track are especially festive, with a dixieland band playing between races. In 2004, Penn National bought the rights to manage Bangor Raceway and has since unveiled plans to revamp Bass Park and the raceway to include a slot machine parlor, enclosed grandstand, a hotel and conference center, and new barns. Bangor's Mansfield Stadium is the site of Little League Baseball's Senior League World Series, held each August. Children and adolescents have no problem staying busy year-round in the Queen City. Bangor East and Bangor West Little Leagues offer minor league baseball for children ages 7-12 and Little League baseball for children ages 9-12. Softball is also an option for girls at the Little League, Junior League (13- and 14-year-olds) and Senior League (15- and 16-year-olds) levels. Bangor West and Bangor East combine players from both leagues to play Junior and Senior League baseball at Mansfield Stadium, which features major-league distances to the outfield fences, minor-league-level lighting, a full-size scoreboard and a 1,500-seat grandstand replete with concession stands and rest rooms. The Bangor East Little League plays its minor league games at the William S. Cohen School athletic field on Garland Street and its Little League games at Taylor Fields, off Forest Avenue. Bangor West's fields are on Thirteenth Street behind Fairmount School. Softball fields are behind Fourteenth Street School, at Hayford Park on Thirteenth Street and at Bangor High School on Broadway. 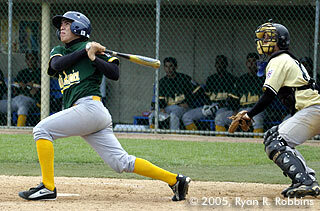 Little League sign-ups are usually held near the end of March, with tryouts in April. The regular season lasts from May through June, with the Maine District 3 playoffs running for about three weeks from the beginning of July. No other event brings communities together like the annual boys and girls high school basketball tournaments at the Bangor Auditorium. High school basketball helps Mainers pass the time during the state's long winters. In February and March, thousands of fans from eastern, central and northern parts of the state flock to the Bangor Auditorium for the annual boys and girls tournaments. The games are so popular that local radio stations and the Maine Public Broadcasting Corp. broadcast the games. The tournaments have been a staple at the Auditorium since it opened in 1955. Soccer has become increasingly popular among youths in the last few years in the Greater Bangor area. The nonprofit Bangor Soccer Club offers a spring program and a travel program. In 2001, the travel program went to the United Kingdom to play youths from that country. The spring program is for boys and girls in grades kindergarten through eighth and runs from May through June. Soccer fields are at the Bass Park infield, Downeast School, Union Street Athletics Complex and Mary Snow School. The city of Bangor's Parks and Recreation Department also offers a soccer program, for children in grades kindergarten through fifth. The program runs in the fall. The 2003 Kenduskeag Stream Canoe Race attracted more than 700 canoeists and kayakers. The spring thaw and the rapids it brings in Maine's streams and rivers make for ideal conditions for canoe and kayak racing. 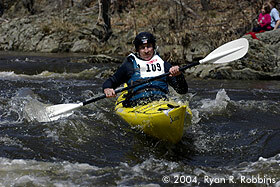 The 42nd annual Kenduskeag Stream Canoe Race will run in April 2008. With more than 700 participants of all abilities, the race begins in the village of Kenduskeag, 16 1/2 miles from the finish line in downtown Bangor. Thousands of spectators turn out on the banks of the Kenduskeag to cheer family and friends or marvel at the skills of the more serious competitors as the competitors negotiate ragged boulders and debris from the spring thaw in the rapids. A fan favorite is Zip Kellogg. Almost every year, Kellogg dons a white tuxedo and maneuvers about the course while standing. The Bangor Parks and Recreation Department sponsors the race. Registration begins in mid-winter. For more information, call (207) 947-1018. 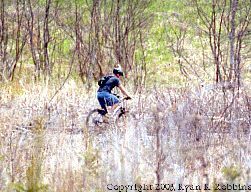 A mountain biker makes his way through City Forest's arboretum. It's a flat ride in the area, but the steep 100-foot City Forest Hill awaits. Biking enthusiasts have a wide variety of terrain to choose from in the Bangor area. Winding country roads in the city's outskirts and neighboring towns are perfect for road cycling. Mountain bikers will find trails at Bangor's Essex Woods Recreation Area and Rolland F. Perry City Forest challenging. Essex Woods, on Watchmaker Street, is the site of several organized races each summer, and City Forest, off Kittredge Road and Tripp Drive, features 9 miles of trails that cover everything from graded dirt to roots, stumps, mud, rocks and steep inclines. Hiking opportunities abound throughout the Queen City and surrounding towns. Bangor City Forest has more than 9 miles of trails, with chances to see deer, bears, moose, beavers and other wild animals in their natural habitats. Shorter trails elsewhere in the city include the Kenduskeag Stream Trail, which runs from downtown Bangor to about two miles from the center of downtown; Essex Woods; Brown Woods; Prentiss Woods; and Fred Boyce Trail at Dorothea Dix Psychiatric Center. Mount Hope Cemetery also provides a peaceful and scenic surrounding. The University of Maine offers miles of hiking trails that double as cross country skiing trails in the winter. Other popular trail systems outside of Bangor include the Hirundo Wildlife Refuge in Old Town, Sunkhaze Meadows Wildlife Refuge in Milford, Leonard's Mills in Bradley and Chick Hill in Clifton. See the Trails page for more information on Bangor's trails. If golf is your fancy, you can visit the 27-hole Bangor Municipal Golf Course on Webster Avenue on the city's west side. The par 72, 18-hole main course features 6,500 yards. Golfers can practice teeing off on the driving range, have access to carts and enjoy snacks at the clubhouse's snack bar. The course is host of the annual Greater Bangor Open and Paul Bunyan tournaments. The course's season runs from early-April through November, weather permitting. For more information, call (207) 941-0232. Other 18-hole golf courses in the area include Penobscot Valley Country Club in Orono and Hermon Meadows in Hermon. Hermon Meadows is a par-72, 6,294-yard course. Its season runs from early-April through October, weather permitting. On U.S. Route 2, Penobscot Valley Country Club is a par-72, 6,445-yard course. Golf Digest rated the course as the fourth-best in Maine for 1997-98. The club's season runs from mid-April to mid-October. For more information on Penobscot Valley, call (207) 866-2423.